Found this guy on the mirror of my truck this morning when I left for work. While it was totally unexpected, he managed to stay on the mirror for the entire trip. When I returned to my truck this afternoon I was surprised to see that he was still on the mirror. As I drove home, he moved from the mirror to the windshield and then to the roof of the truck. He remained there long enough for me to take this photo then moved back to the windshield where he can still be found hours later. Not sure if he will be riding with me again tomorrow or not. 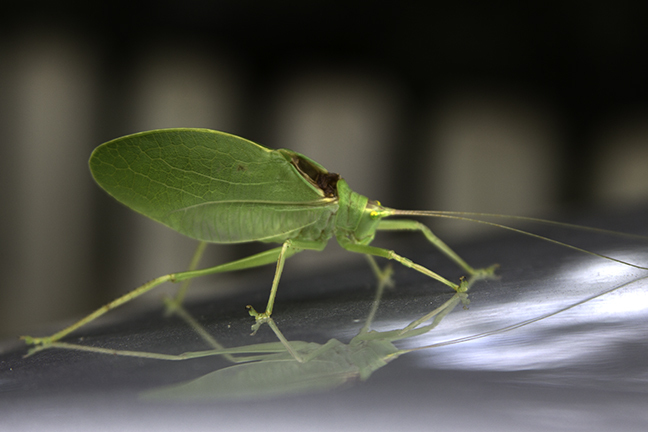 I’ve tried to identify him and the closest I can find is that he may be a False Katydid. Can any of my entomologist friends, or someone who really likes insects, confirm his identity?